many thumbs up for this cupcakes too!! even when i brought 2 to my office yesterday, my colleagues say it is simply to lovely to eat. Very adorable and you have a delicate fingers to create those doggy. You are simply great!!! I will definitely engage your service to our event in near future. 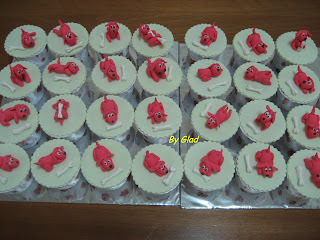 btw, if we wish to order more cupcakes, is it possible (for future order). very fine and beautiful art work done, Glad. o wow, you are really talented! I too can't bear to eat those lovely cupcakes. I would have snap and snap all the photos before even considering putting the cup cakes in my mouth. may i pls know how much min order and the cost? thank you! Thanks for your kind words. Please drop me an email gladcake@yahoo.com.sg to discuss further if you are interested.